A HUGE vintage mirror for $25!!! The size was perfect for the wet-bar and I loved that the wood tone would play off of our mid-century media stand on the opposite side of the room. Plus, I felt like I was replacing the vintage mirror that we’d torn out with a BETTER vintage mirror. Vintage-lover-guilt officially stowed. I texted the seller, who stated that it was still available and that she could meet me in Fort Worth (which is halfway between us) the following day. I met her as planned, loved the mirror even more in person, and took ‘er home. As for the bar styling, it’ll change. There’s a bit too much brown happening with the wine-rack, but it was all I had (fornow), so it stays until I either paint it or find something else. I can’t tell you how perfect the mirror is, though. I literally bounced around the house in excitement when I saw it in the wet-bar. I mean, the size couldn’t be better and the shape really softens the bar and makes it feel less square. Once the lighting situation changes with the addition of two pendant lights and that peach countertop bites the big one, the bar will appear much more balanced and bright. I really think that adding concrete to the counters will add some nice visual weight below and a cool contrast in color and texture which will further balance the space. I plan to use some sort of modern small mosaic tile behind it. Something simple that lets the mirror shine, but still adds a touch o’ bling. I have no idea what yet, but I’m tossing around a solid color square glass mosaic, or maybe a sleek penny tile. It really depends on how the space feels with the concrete counters and difference in lighting, so we will see. 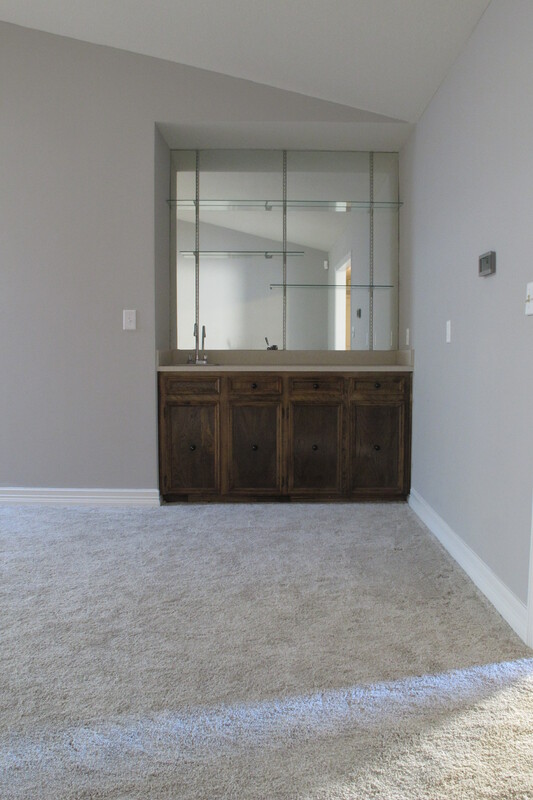 Your wet bar is looking fantastic! 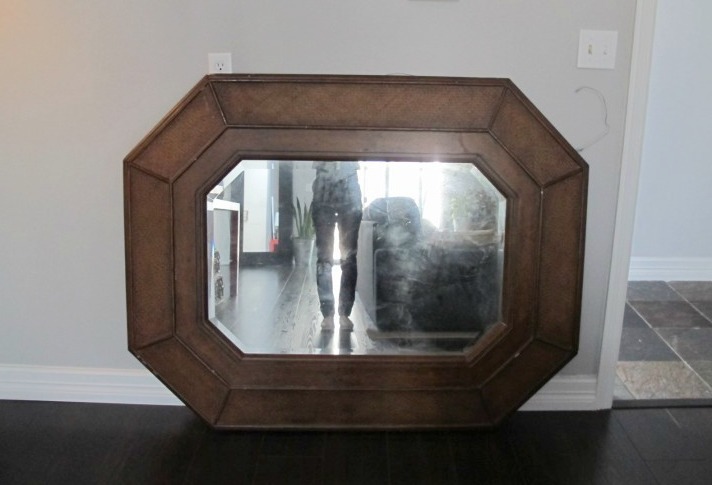 I totally agree that new vintage mirror (swoon, btw!) fits so much better than the square one. Can’t wait to see what you do for the finished look! Thanks, Erica!!! I’m just so, so excited that I was luck enough to find it! It was a happy day! Haha!! 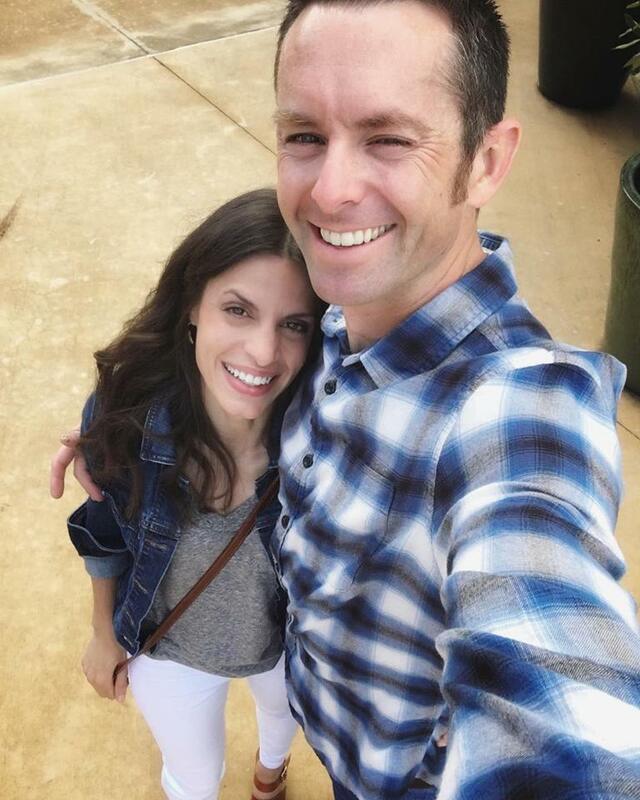 MB’s sister here… and my first reaction when I saw the mirror in place was HOLY CRAP IT’S PERFECT. Hahaha I love that you showed up here. I have only one word “awesome mirror” oops, that’s two words! You’re awesome too:-)! Thanks, Astin!!!! We’re totally loving it!!! !